Different shades of granites are available all over the world and blue is one of the accepted shades among them. Blue granites are also pricey because it is quarried in small amount. And Vizag blue granite is one of the varieties of blue granite. This particular granite is found in Southern India. It is fine grained granite and has light to dark blue backdrop. There are light and dark gray shaded veins on its surface. It is a normal stone which is resistant to frost .These granites are available in slabs and tiles form. This granite is strong, lightweight and easy to install. 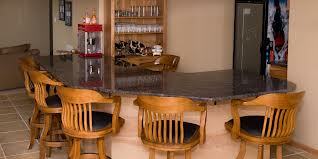 This granite is scratch resistant and easy to clean. Vizag blue granite is best for flooring. In addition to, it is used for kitchen countertops or bathroom. The classy look of this granite is appropriate choice for offices. If you have picked up Vizag blue granite for countertops and flooring of your kitchen, then it can be slight decorating challenge in painting the kitchen with blue shade. Because, too much blue shade can overshadow the space, particularly if it is small. However, many color options can make contrast, harmonize and brings striking effect that really makes the blue color prominent. Use white color for painting the kitchen wall and cabinets. You may use ivory shade instead of white color. It will break up the blue between the countertops and floors of the kitchen. You can use orange shade for contrasting the blue color of Vizag blue granite. According to color wheel, orange opposes directly the blue color. It means that though these colors are radically different, the effect is really pleasant to the eye. You may choose a light yellowish orange. Whether you want to use the harmonizing shades, pick up the darker or lighter blue shades for your kitchen cabinets and walls.For instance, you may choose the navy blue shade for your kitchen cabinets and walls which will harmonize the Vizag blue granite shade. Try the daring shades like yellow, red or orange for your kitchen walls and cabinets when you have used Vizag blue granite for your kitchen floors and countertops. It will make your kitchen praiseworthy. If you opt this granite species as kitchen countertops and kitchen flooring, you should also be careful about the decoration of your kitchen like cabinet colors, appliances, accessories etc. Stainless steel equipments are the appropriate choice for Vizag blue granite. It provides about balanced finish. The color of these equipments highlights the lighter colors of this granite. It gives a larger look to your kitchen and also tone down the darkness of the room. Use dark terracotta pots as enhancing objects and an enclosure for the items of your kitchen. Then your kitchen will get a complete look.